What amazing weather - it's more like summer than late winter! 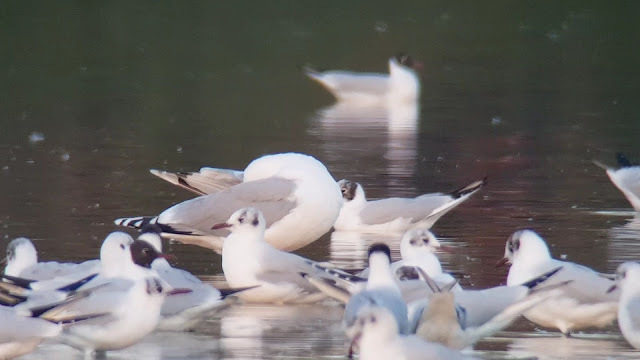 I keep expecting to see Swallows and Sand Martins about as I look through the gull roost each evening.Despite the hot weather the gulling hasn't been too bad though rather tellingly numbers have started to decline dramatically over the last couple of days. What's more, the floods are starting to shrink rather alarmingly in this hot weather so we really need some good prolonged rain to top them up again. 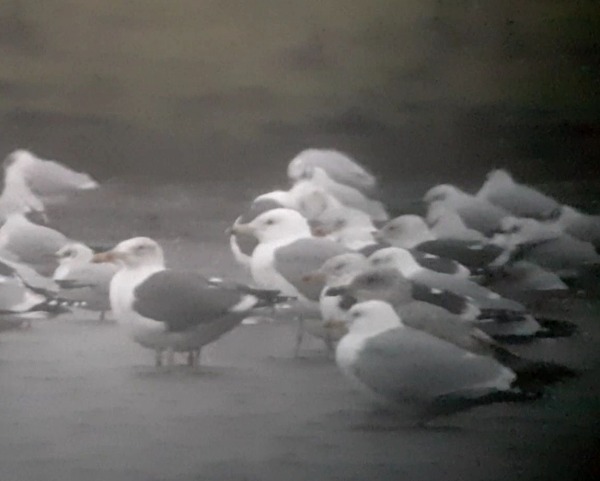 Still we've had another couple of good gulls to add to the tally of what has been a remarkably good couple of months on that front. Firstly there was a huge adult CASPIAN GULL and secondly a lovely adult MEDITERRANEAN GULL. The latter species traditionally has a spring passage through the county in March so it looks like that has come early this year. 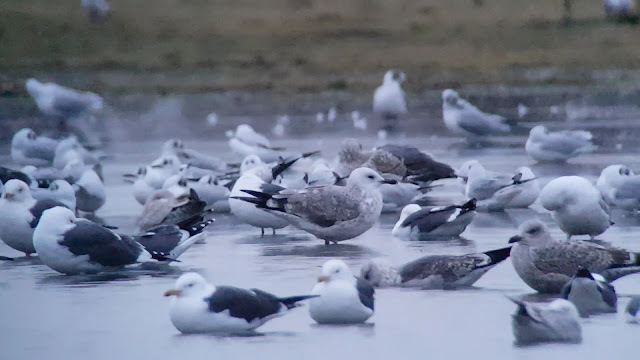 In fact we've now had 7 different Caspian Gulls and two Mediterranean Gulls as well as countless Yellow-legged Gulls just since the start of the year - it's been a remarkable gulling season. 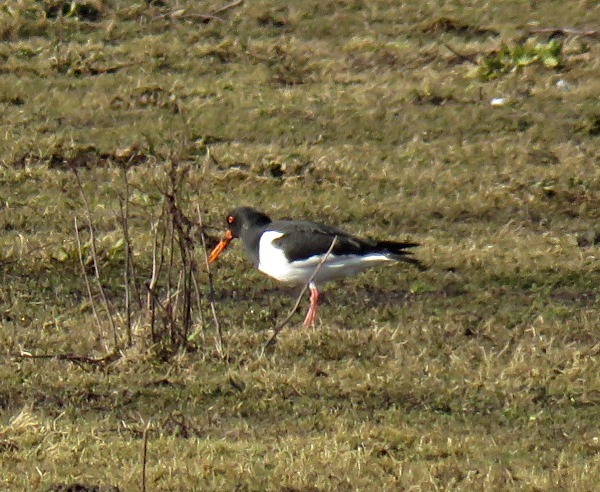 We've finally started to get some wader action now with up to 8 REDSHANK around the floods, and this evening the OYSTERCATCHER tally had gone up to 3. 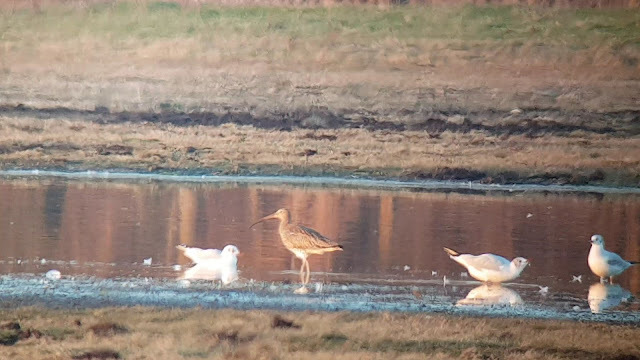 A single DUNLIN (a year tick) has been around the last couple of days and to top all that we had a brief visit by a CURLEW (a less than annual visitor to the Meadow) though it didn't linger. In other news Mary MacDougall reported a couple of GREY PARTRIDGE on the Patch as well. As this species actually bred here last year I'm deliberately being vague about the exact location but it's great to have them back again. The much milder weather has brought on the first signs of spring in the bird world. Whilst it's still too early for any actual summer migrants we've had a couple of species on the floods which I typically associated with very early spring, namely OYSTERCATCHERS and SHELDUCK. There was one of the former on Friday with the number going up to two over the weekend along with three of the latter species. Whilst we already have Shelduck on the year list, it's around this time of year that they start to be seen on the floods. There was also a report of a STONECHAT on the scrub north of the Perch this week from Sam Watson. Since the two extremely cold winters that we had a while back this species has gone from a guaranteed record each year to something much harder to get so it's nice to have one seen on the Patch so early on in the year. On the gulling front, it's been much quieter this week. I visited each evening from Monday through to Thursday with precious little reward for my efforts apart from a couple of YELLOW-LEGGED GULLS. 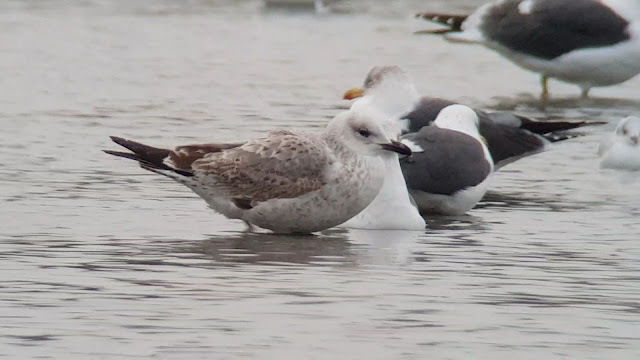 Then Thomas Miller took over for the weekend and his keen eyes managed to pick out a couple of CASPIAN GULLS, both birds that we've seen earlier on in the month here. The warmer weather has brought out the first BRIMSTONE butterflies to various local gardens (including my own) and the first bees are now buzzing about as well. With all the talk being of a record breakingly hot year this year, we might well have a very mild and early spring this year. 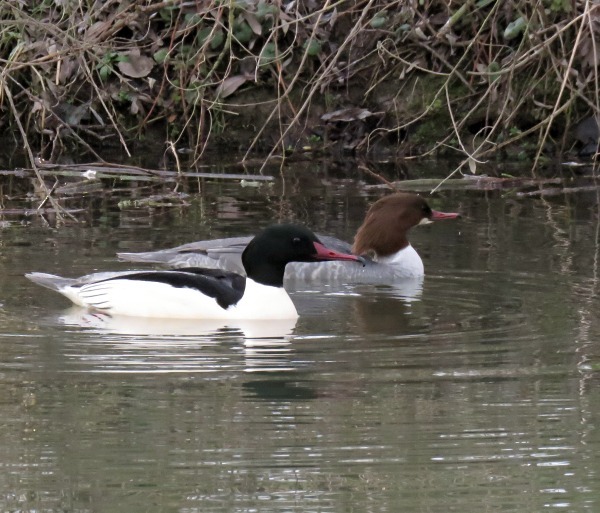 I forgot to mention that Dave Doherty found a male POCHARD on the floods this week. As is usually the case with diving ducks they tend not to linger too long once they discover how shallow and fishless the waters are and it was soon gone. Still as a less than anuual visitor it is a good record for the Meadow. A heavy pair of binoculars -- in good condition apparently, except for a broken strap -- has been found on the Meadow and left on the corner house of Longworth and Southmoor Roads. If you'd like to claim them then please telephone 511474. The windy weather, with Storm Eric, brought in a brief purple patch on the Meadow with some huge roosts towards and during the weekend with vast numbers of large gulls. The only trouble was that the wind often made for difficult viewing conditions. On Thursday in very blowy conditions there were at least 4 YELLOW-LEGGED GULLS in the throng and a flock of 200 of the BARNACLE GEESE came in to roost, one of the higher counts for this flock for quite a while. To add to this there were 100 GOLDEN PLOVER, again one of the largest counts that we've had for quite a while. 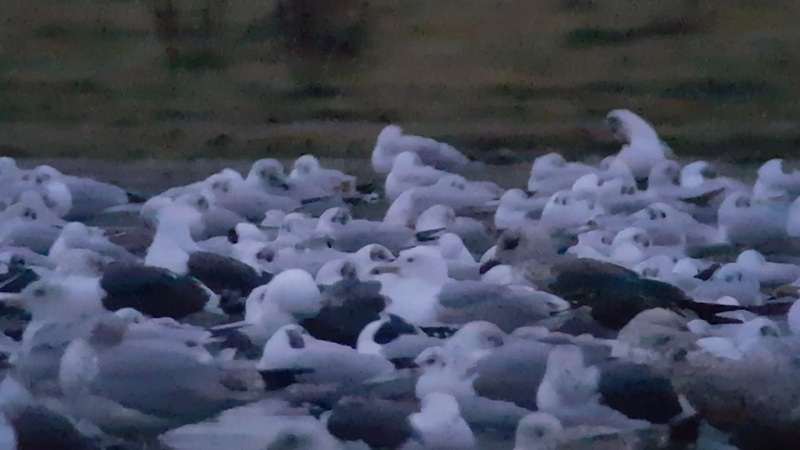 On Saturday Thomas Miller struck gold with no less than 3 CASPIAN GULLS, a 1st winter, a 2nd winter and the 3rd winter from a few weeks back. On Sunday the roost again huge but he reported that it was too windy to do it much justice. This week, in much calmer conditions, the large numbers have now melted away and it's back to more modest numbers. There are a couple more ticks to report: Kingfishers have been reported to me on a couple of occasions now along the river (it was only a matter of time) and Thomas Miller also had the first PINTAIL of the year a few evenings back. Now that we've got through the cold snowy patch and back to milder windier weather, the gulling is back on track. Our first winter MEDITERRANEAN GULL is still being seen most evenings as well as a few YELLOW-LEGGED GULLS (1w, 3w and adult this evening) and we've had a REDSHANK pop in on a few occasions as well. 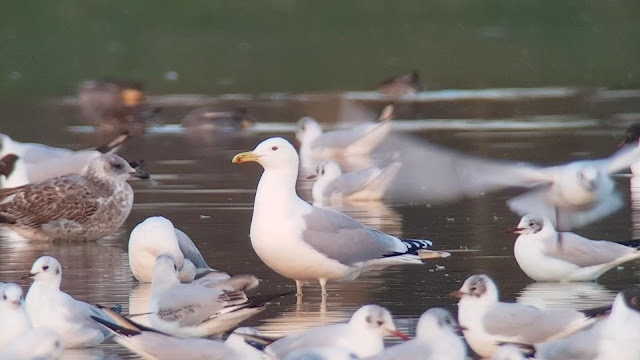 However, after last month's amazing tally of four different Caspian Gulls, so far this month we've not had any. We also had our first LITTLE EGRET of the year this evening: working its way along the ditch down by the boat moorings.Also a drake TUFTED DUCK on the floods this evening was a most unusual sight. Whilst this common diving duck can usually be found up at the Wolvercote Lakes, we only normally see it down at the south end of the Meadow when it's frozen or the floods are in Lake Mode so this was a notable record. The most stand-out record since my last post was an amazing sighting of a KNOT up at Wolvercote Common just south of the allotments by Colm O Caomhanaigh on a very snowy 2nd February. I can only guess that it was grounded by the weather and with everything frozen had just decided to tough it out where it was until it thawed - I hope that it got through it all OK. Knot is less than annual on the Meadow so is a good record to get on the books. With the Snowdrops and Crocuses now coming out and the milder weather one can't help but start to turn one's thoughts towards Spring though we've still got a fair way to go yet before we can start to think about the first spring arrivals. In the meantime it will have to be gulls to keep us going through the month! So that's the first month out of the way. Looking back it's not been too bad really. It's always fun to chase around after the usual winter birds to get them on the year list and the gulling has been excellent this month. Since my last post we've managed to notch up yet another CASPIAN GULL, this time a fine 3rd winter that Thomas Miller found last Saturday. 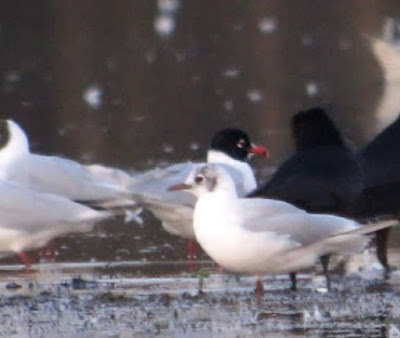 In addition the usual (presumably) 1st winter MEDITERRANEAN GULL popped in again last Friday. However, since the recent spell of cold weather the floods have been completely frozen and I've not bothered with the roost. Apart from that there's not been anything of particular note.